Diffraction efficiency of volume Bragg grating, whose period is in the same order as the incident wavelength, is related to the polarization direction of the incident linear polarized beam. When two linearly polarized recording beams with the same polarization direction are used for recording volume Bragg gratings in a photopolymer with diffusion amplification, the azimuth of polarization of the reconstruction beam influences the diffraction efficiency of the grating. When the probe beam is linearly polarized and oriented orthogonally to the grating vectors, the ?-order diffraction beams are also linearly polarized with polarization direction parallel to that of the probe beam. 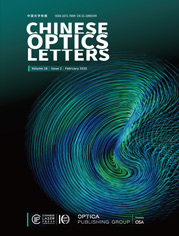 According to the results, a two-dimensional nonspatial optical filter consisting of the volume Bragg gratings would achieve significantly higher efficiency.